II. How Aloe Vera Help? VI. How Long To Treat? Skin with whiteheads, blackheads, acne, and pimples is the reflection of improper nutrition, hormonal imbalances, and bad personal hygiene. 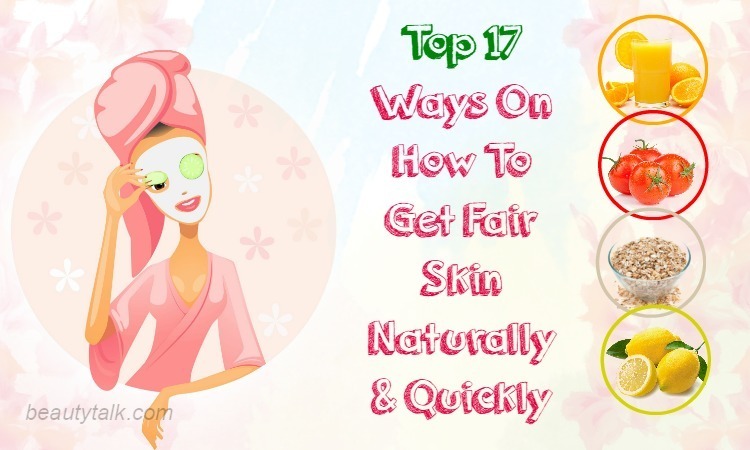 All of us hate skin problems because everybody likes having a clear & blemish free skin. But the skin will look blemished due to pimples. A pimple develops when oil glands or sebaceous glands, become infected and clogged, leading to red, swollen lesions filled with pus. 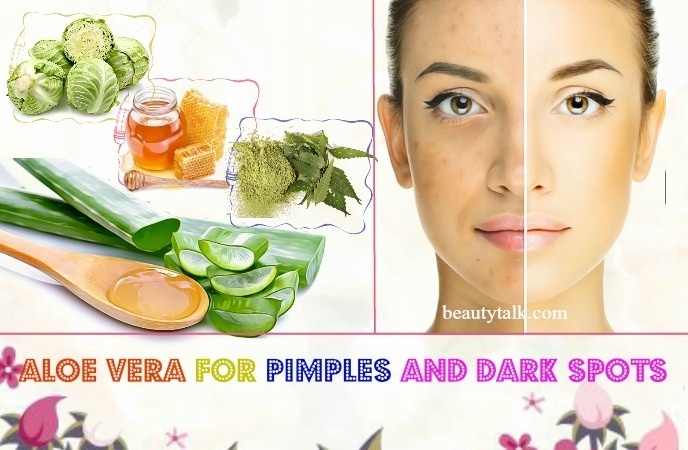 Pimples can be cleared with a proper diet together with simple home remedies. Home remedies for pimples use natural ingredients which are easily available such as aloe vera, apple cider vinegar, honey, and garlic. 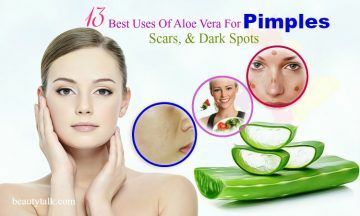 Here, we, Beauty Talk, will particularly discuss the best ways to use aloe vera for pimples, scars, and dark spots in details. 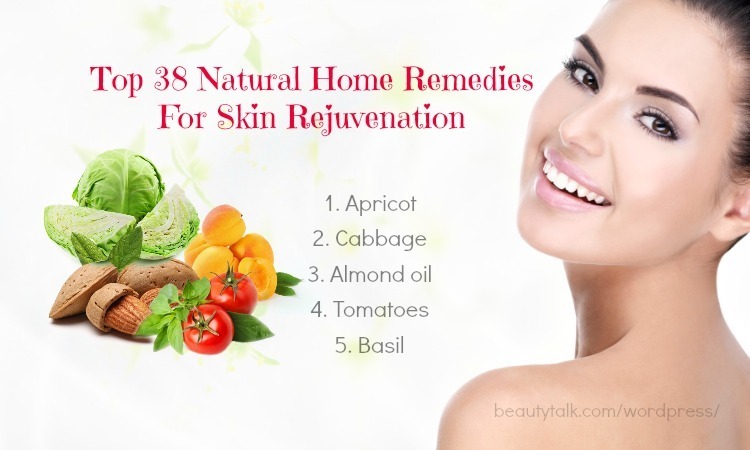 Just try the following methods regularly without fail, and you can notice spotless and glowing skin. 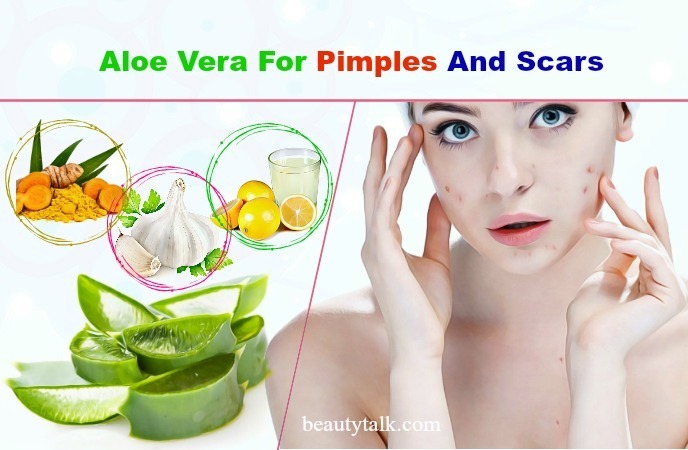 I. Aloe Vera For Pimples – What’s Aloe Vera? Aloe vera has been used for thousands of years for lots of different kinds of skin disorders around the world. It has originated in Northern Africa, the Arabian Peninsula, and Madagascar. It’s a short-stemmed, thick plant, which stores a lot of water in its stems, leaves, and roots. It’s recognized by its pointed, thick, and fleshy green leaves that can grow to about 30 to 50 cm in length. Its leaves are packed with a gel-like substance containing numerous beneficial compounds. This plant is used in the pharmaceutical and food industries, and cosmetic. Plus, it’s used as a great active ingredient in soaps, sunscreen lotions, moisturizers, and face washes thanks to its calming, curative, and moisturizing agents. II. Aloe Vera For Pimples – How Does It Help In Controlling Pimples? 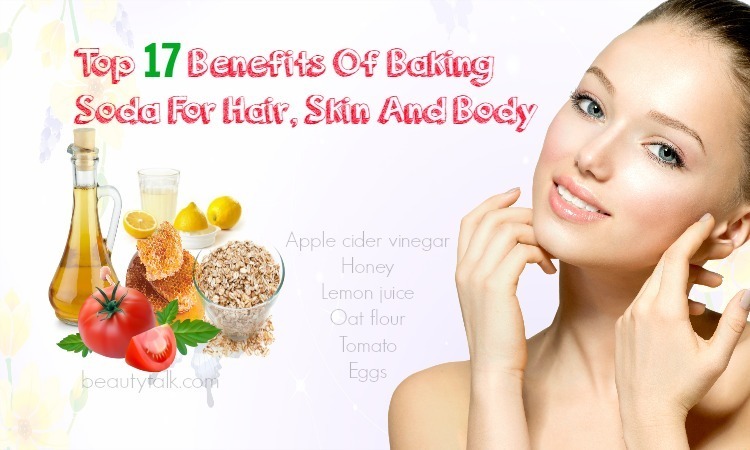 Aloe vera is considered as one of the excellent foods for beauty across the world. It can deal with a variety of skin ailments including pimples. It exhibits the glycol-proteins which can soothe the inflammation, redness, irritation caused due to pimples. 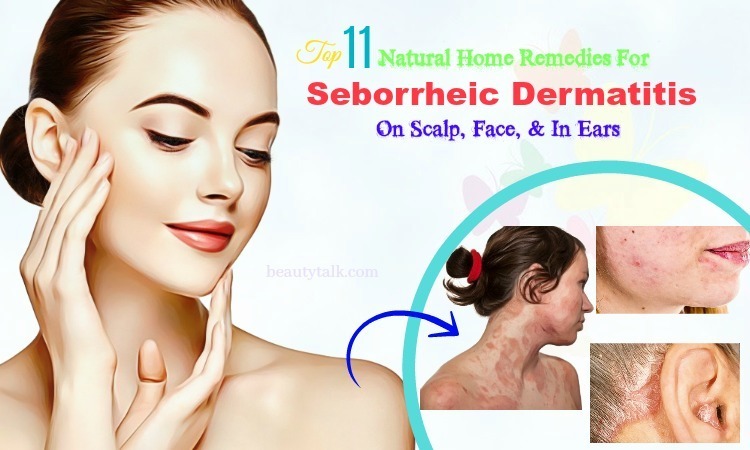 Apart from that, it possesses saponins such as gibberellin, polysaccharides, and mannans, which all work wonders in killing bacteria and viruses responsible for acne or pimples. Plus, the presence of salicylic acid in this plant is useful for unclogging the pores and removing acne, whiteheads, and blackheads from the skin. 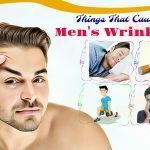 Not only that, it is excellent in reducing the appearances of scars, spots and blemished caused by pimples and acne by lightening the skin pigmentation. The healing properties housed in aloe vera help rejuvenate the skin cells, which in turn diminishes dark spots gradually. Moreover, it functions as a natural astringent that keeps the skin pores free from the sebum and cleaner. Firstly, use mild antibacterial soap together with water to wash your face and later dry it completely. Then, pick up an aloe vera leaf and extract the gel from it. After that, apply this extracted gel on your clean affected skin and leave the application on an entire night. The next morning, you wash it off. For best result, try this method daily. The initial step is pouring boiling water over the pre-shredded aloe vera leaves. The next step is boiling for a minimum of fifteen minutes. Turn off the heat afterward and let the solution cool. Strain and wipe the affected skin with this liquid. It’s best to use this remedy two times per day. Lemon juice for pimples is highly useful since it can decrease oil, reduce redness, eliminate bacteria and boost the healing process. Plus, it embraces natural anti-inflammatory effects that can alleviate the itching and discomfort caused by acne or pimples. Also, it has antioxidants, which can help enhance healing and act as a scar therapy. In fact, this treatment battles pimples and heals the marks and scars. Firstly, take the aloe vera gel in a bowl or a small plate and the lemon juice to it. Mix the two ingredients with a spoon. Clean your face and start applying the mixture on it. 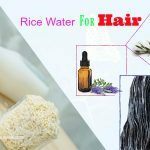 Leave it on your face for overnight and wash in the next day with normal water. According to a study, turmeric or curcumin supplements and products both topical and oral may offer therapeutic advantages for skin health. Turmeric contains antimicrobial properties that are helpful for killing the P.acnes bacteria causing acne or pimples. Plus, the antioxidants housed in this yellow spice contain help to heal the process of pimples while preventing the scar formation. More importantly, when applied on pimple and acne-prone skin, the curcumin in it works to get rid of the bacterial infection causing the acne breakouts and soothes and heals the inflamed skin. Applying turmeric regularly will give you glowing, clear and blemish-free skin. Add the turmeric powder in the aloe vera gel. Mix these elements thoroughly and apply the mixture over the pimples with the help of clean fingers. Leave it overnight and in the morning, wash your face with a gentle face cleanser. Due to its antibacterial properties, garlic helps to battle bacteria causing pimples. 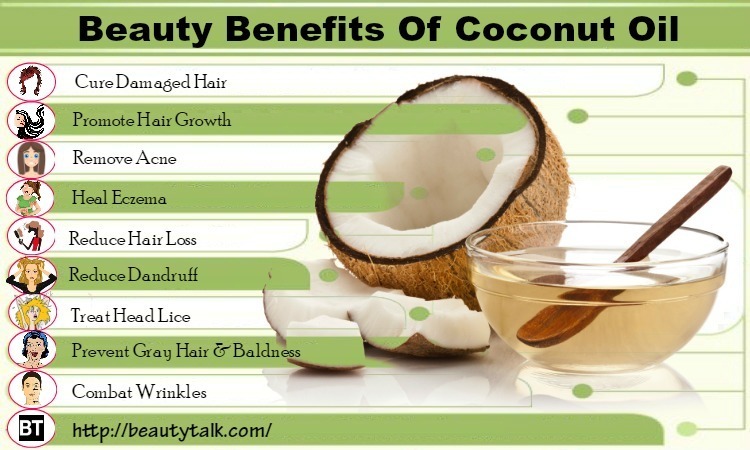 Plus, it assists in absorbing excess oil, reducing the inflammation and fighting free radicals. Along with that, garlic contains sulfur compounds called thiacremonon that serve as a drying agent. Regular use of garlic can help you achieve clearer skin without scars. Firstly, peel, crush, and squeeze the cloves of garlic to extract its juice. Later mix the juice with the aloe vera juice or gel. Then, gently massage the solution on the affected areas with fingertips. Rinse with water after 15 minutes and pat dry. Reapply daily for best results. Crush the garlic cloves at first and add the crushed garlic to the water. Add the aloe vera gel to it after five minutes. Start applying it on your pimples affected regions and keep it on until it completely dries. Rinse with water afterward and pat dry. It’s better to follow the process daily. Tea tree oil helps to remove the pimples and its scars. This oil is well known for its terpinen–4, which works effectively on killing the bacteria causing acne. It can penetrate deep into the pores to fade away toxins and inhibit the clogging responsible for acne and lighten the scars. It additionally eases inflammation and gets rid of dead skin cells to lessen scars. Just mix the tea tree oil in the aloe vera gel. Mix everything well with the aid of a clean spoon or clean fingers. Then, clean for your face before applying this mixture with a cotton ball. Keep it on overnight and in the morning, wash your face with a normal wash. Do the process daily. Thanks to it’s a high content of antioxidants, vitamin E oil is perfect to diminish acne and acne scars. 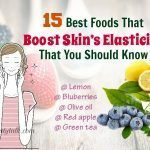 It is also beneficial for controlling the production of skin proteins including elastin and collagen, which make it potential for treating acne and pimples. Lemon juice is a powerhouse of vitamin C, a type of antioxidant, which can lighten the skin. It also prevents the development of skin spots. Combine all the above components to create a creamy paste. Then, apply it on your affected regions and massage for 3-5 minutes in circular motions. Let it stay for thirty minutes before wiping it off by using a damp clean cloth. For the desired result, repeat the treatment daily. Pineapple juice is a beneficial remedy to remove moles, blackheads, and pimples. It is high in vitamin C and contains natural germ killing properties. Plus, it helps to cure pimples quickly thanks to its antioxidants. 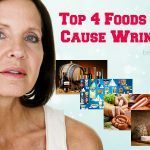 Besides, these properties help to battle the damage of free radicals and increase the collagen production. This, in turn, helps fight dark spots and pigmentation. 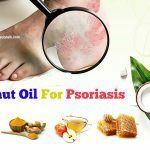 Furthermore, it makes the skin soft and firm due to its bromelain. Smash the pineapple and strain the juice. Mix about a one-half spoon of pineapple juice with the aloe vera juice. Start applying the juice mixture directly on your pimples. Wash off after 20-30 minutes with plain water. You can repeat this treatment twice per day for best results. 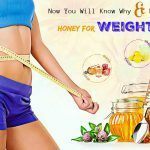 Honey is packed with antioxidant and antibacterial qualities, all of which are perfect for clearing dark spots and treating acne and other skin ailments. It can also deep cleanse skin pores, eliminating grime, bacteria, pollution, dirt and excess oils. It additionally helps to rid the face of excess oil and keeps your skin healthy, thereby preventing pimples. Boil the leaf of aloe vera in water for around 5 to 7 minutes. Later crush the leaf and to it, add the honey. 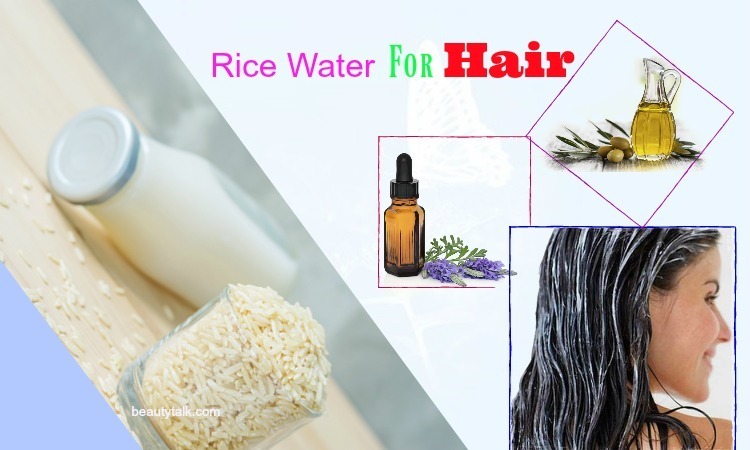 Stir well and start to apply it on the affected skin. Gently massage for 3 to 5 minutes and rinse it off after 20 to 30 minutes with cold water. Repeat the same procedure regularly. Make a smooth paste by blending the honey, aloe vera gel and rose water. Add the turmeric powder to it to help brighten the complexion. Then, apply this mask on your pimple prone areas and wait for 20 minutes before washing it off. Reapply it three times per week to quickly get rid of pimples and dark spots. A combination of neem powder and aloe vera is ideal for lightening dark spots, sun spots, black spots, and leaving your skin smooth, clear and clean. Neem consists of the antiseptic properties that assist in eliminating darks ports caused by acne or pimples. Apart from that, neem holds the properties such as astringent, antibacterial, aesthetic, antifungal and antiviral properties, which are useful in combating the skin infections, acne, allergies, skin rashes, pimples, itch, inflammations, and scars. Just combine all the above ingredients thoroughly to create a paste. Apply it on your pimples and dark spots and rinse off by using warm water after 15 to 20 minutes. Repeat this simple way two to three times per week. Cabbage is high in water and contains healing properties, making it an ideal remedy for pimples. Additionally, it is helpful for controlling pimple breakouts and healing the skin. Plus, it is also full of vitamin B6, C, and K, which work wonders in fading away from the dark spots, black spots, and hyperpigmentation. Its vitamin C can help manage the oil production and enhance healthy and glowing skin. Firstly, blend the cabbage with the water to have a paste. Later combine two tablespoons of cabbage paste with the aloe vera gel. Start applying the paste on your pimples and dark spots. Rinse off after 15 – 20 minutes using cool water and pat your skin dry. It’s advisable to repeat the process twice to thrice per week. Drinking aloe vera can cause harm. Some individuals may develop an allergic reaction to this plant. Symptoms of an allergy may consist of a rash, redness or swelling. Stop using aloe vera if these symptoms happen. Many methods for utilizing aloe vera involve mixing it with other elements. These elements could lead to an allergic reaction on your skin. An individual should stop mixing with other ingredients if he or she sees any skin irritation. Before using the aloe vera leaf, make sure to wash it thoroughly. Excessive consumption of aloe vera juice can result in stomach cramps and diarrhea. People, having colitis, hemorrhoids, ulcers, diverticulosis, and irritable bowel syndrome, need to consult a doctor before utilizing aloe vera for dealing with this problem. Using organic aloe vera soap two times daily can be helpful for reducing the pimples and acne and providing a glow to the skin. The soap consists of glycerin so that it can prevent flaky and dry skin. Wear gloves while cutting the aloe vera leaf to avoid irritation. A prolonged habit of consuming aloe vera juice can increase the risk of colorectal cancer together with other health problems. Thus, don’t use this juice or gel in excess. Eat plenty of vegetables and watery fruit and keep the body hydrated to maintain pH balanced and the skin hydrated. If you’re suffering from intestinal conditions such as ulcerative colitis, Crohn’s disease, avoid using aloe latex. Pregnant women should avoid taking aloe vera orally because it might cause a miscarriage or lead to a baby's birth defect. VI. 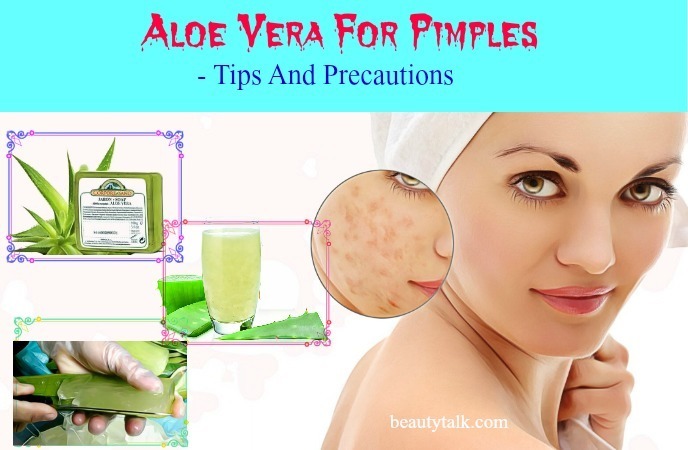 Aloe Vera For Pimples – How Long Does It Take To Treat Pimples? It takes just several days of daily application of aloe vera to notice a difference in your pimples. They’ll begin to heal faster with less swelling and discomfort. You will also start seeing a difference in your scars within 2-3 weeks. It’s important to remember that this plant doesn’t cure acne or pimples, but soothes the infection, redness, inflammation, and swelling related to it. It boosts up the healing process owing to its biologically active components. Regular application of aloe vera can also aid in preventing breakouts in the future. In fact, aloe vera is an inexpensive and effective method to get rid of pimples without causing any side effect. Do you have other ways to use aloe vera for pimples, scars, and dark spots? Feel free to share any way with us. All of the contents provided in this article are for informational & educational purposes. We recommend you consult a healthcare professional to determine which method is appropriate for you.